It was just the other day that we let you guys know that writer-director Jim Jarmusch's zombie-comedy The Dead Don't Die will be unleashed this summer and today we already have the movie's trailer and poster to share! 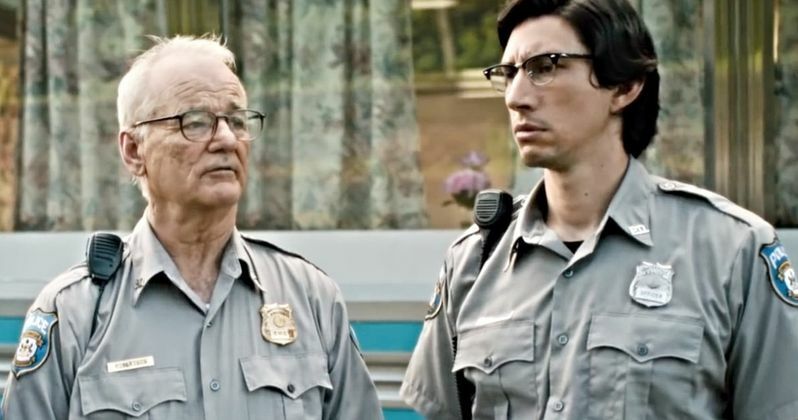 The trailer gives us our first real look at the flick which features Bill Murray and Adam Driver as a couple of cops forced to deal with a zombie outbreak. Overall, the trailer looks to be a lot more fun than I expected. I mean don't get me wrong, the film student in me loves some Jim Jarmusch, it's just that his films tend to be very slow and very dry, to say the least. However, this new movie looks like Planet Terrror by way of Wes Anderson. Interesting combination, right? One of my other favorite aspects of this new trailer is the fact that in this flick the zombies walk around not only doing the things they did in the past - which is a well known rule or sorts dating all the way back to George A Romero's Dawn of the Dead - but Jim Jarmusch adds another layer. In this new film, the undead walks around asking for their favorite drinks ala coffee and chardonnay. It's pretty fun and a subtle twist on the age-old monsters. Plus you've got to love any movie that gives us a look at Iggy Pop as one of the members of the undead horde. Classic. As for the rest of the cast, Chloë Sevigny joins Bill Murray and Driver as a fellow police officer, while Danny Glover seems to be the owner or at least a patron of a diner where the outbreak starts. Tilda Swinton then appears to be a mortician makeup artist - who also wields a samurai sword and is more than confident in her ability to defend herself against the undead. And Steve Buscemi plays Farmer Miller who appears to end up at the business end of a set of chomping zombie-teeth. On top of that, Sara Driver is a zombie, Rosie Perez seems to be playing a TV reporter, and the RZA is a UPS man. Meanwhile, Tom Waits will be some sort of homeless woods-dweller, and Selena Gomez looks to be playing ... a moody teenager. On top of the trailer today we also have the movie's poster which strangely enough doesn't showcase any of the killer cast members. No, instead of featuring Bill Murray and Adam Driver back-to-back with shotguns and shovels as you might expect, the poster instead goes for what has got to be the most cliche zombie image of all time: the hand rising out of the grave. Great trailer, weak poster. What are you going to do? Can't win them all, Jarmusch. Jim Jarmusch (Stranger Than Paradise, Only Lovers Left Alive) directs The Dead Don't Die from a screenplay he wrote himself. Carter Logan (Only Lovers Left Alive, Paterson) and Joshua Astrachan (A Prairie Home Companion, It Follows) produced, and Frederick Elmes (The Object of My Affection, Allan Quatermain and the Lost City of Gold) handles the movie's cinematography. Animal Kingdom is behind the film which will be distributed into a theater near you by Focus Features on June 14, 2019. This trailer comes to us via Focus Features' official YouTube channel.